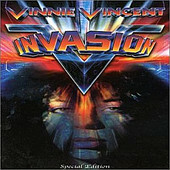 In Music We Trust - Vinnie Vincent Invasion: "Self Titled" / "All Systems Go"
EMI, in an apparently loose mood, let's go two lost wanderers of yesterday's hair generation with two sought after lost "classics" from the enigmatic Vinnie Vincent and his Invasion. Like many of the Glam Metal records of their day, they don't stand the test of time too well, but they're sure fun to go back and listen to again. Now appearing in all their glossed up and teased glory with the added attraction of digital remastering, VVI's self-titled 1986 debut and their "All Systems Go" '88 follow up made a respectable impact but had inexplicably little lasting effect. They were an unlikely combination of Hair Metal fluff Rock with virtuosic tendencies that featured the fast flying finger work of an overindulgent post-Kiss Vincent with the gratuitously chickish frontmen vocalists. One look at the back cover band photos says a lot about the era they started in, but upon further listen, there was solidity to the playing that steps yards beyond what most of their ilk were capable of producing. Vincent's initial claim to infamy was as fill in guitarist on Kiss' bare-faced "Lick It Up" line up. Short-lived though it was (Vincent having been invited to leave shortly after the '83 tour began) it was a record that barely hinted at the fretboard freedom he allowed himself on his solo endeavors. Three years later, as if to prove a point against the prohibitive measures of the Paul and Gene team, the simply titled "Invasion" emerged and really cut into the surface of showmanship versus soloism. And the Metal fans took notice right away. "Invasion" appeared at the right time when Pop Metal's popularity was peaking. They featured four poseurs with unimaginably big hair, even by true feminine standards, and a number of anthemic crashers like "Boyz Are Gonna Rock," "No Substitute," and "Animal" all laid out for maximum consumption by the ladies and the air guitar-God in the making. The featured element was unquestionably Vincent's unstoppable and indecipherably quick finger work. The songs themselves were timely and on a level with the Crue's, Ratt's, and Quiet Riot's of the day, as well as the soon to be Cinderella's, Poison's and Winger's round the corner. They boasted the soaring, swooning, sometimes sketchy vocals of the long forgotten Robert Fleischman, a John Waite look-alike that held his own, and beneficially backed by a tight rhythm section headed by bassist Dana Strum and stool jumping drummer Bobby Rock. Vincent's playing steals the spotlight however, effectively drowning out the background "music" with a run of imperceptibly sloppy scales and double-picking that overstates the obvious on more than one occasion -- throw technique out the window, flash is the fashion! VVI's first record produced some damn quality tunes -- the aforementioned "Boyz Are Gonna Rock" opener, plenty of heavy riffage with "Animal," "Twisted" and "I Wanna Be Your Victim"; the sorely underrated power ballad "Back On The Streets," which was later redone by Europe's John Norum and garnered maybe an inch more attention if any; and the potent closing epic, "Invasion," that in itself is reason enough to pick this one up. VVI's next album in '88 had more going for it. The band had a successful debut under their belts, toured the world under the tutelage of greats like Alice Cooper and Maiden, and an obviously broader budget for the aptly titled "All Systems Go" which featured fuller sound, cleaner production and hot new vocalist in Mark Slaughter. Somewhere along the line, someone might've suggested to Vincent that soloing can still impact while keeping the focus on the overall song. The result is a much sharper, shapelier record with more groove appeal and slick-shredding over mere showmanship. This time its Slaughter's voice that melts the speakers. With a higher range than Fleischman, though comparably close at certain measures, Slaughter's debut signaled a star on the rise, for him and Strum-- if not necessarily the whole group. "Ashes To Ashes" and "Dirty Rhythm" are two immediate heavy hitters that should've gone further than they did. "Love Kills" was the hit single of the record that lit the charts awhile, but had no real benefit of a capable follower. "Let Freedom Rock" possesses that so necessary Rock band gimmick with Vincent opening the tune with, you guessed it, before cutting into one of the stronger album tracks. "That Time Of Year" was another underappreciated power ballad, along with the Stryper-like "Ecstasy" that finds Slaughter in full tear flow effect. Truth is this album was less impacting but better musically. For one or another reason it just didn't strike the community chord the way it should have. Shortly thereafter VVI were done. Heavy rock fans can't go wrong with either of these picks, both similarly styled records yet very distinguishable from the other. Don't expect any bonus attachments however, as these CD reissues were done mainly as core crowd pleasers for long waiting listeners with the cleared space in their collection.